This is an update to the small tool I made for Unity 2D to save time modifying its settings from the terminal or dconf-editor. -> Icon right click Shortcuts (QuickLists) for launcher settings and compositing manager, which brings window edge shadows and alt-tab thumbnail previews, very handy for multi-tasking. The same shortcuts can be found by searching for them in the dash. 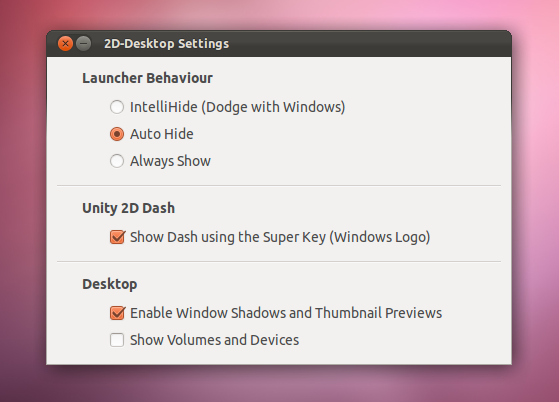 -> An updated (From PyGtk) Gtk+3 GUI with the two available Unity-2D preferences for dash and launcher and a few extras. 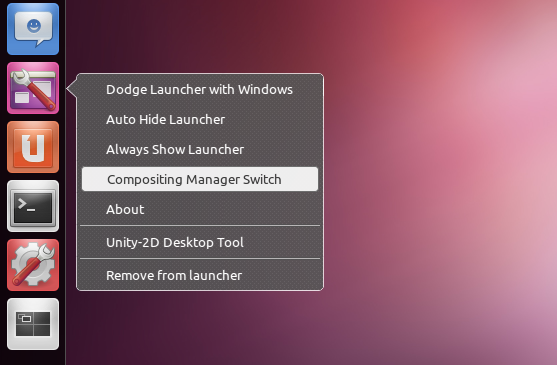 The ‘Always Show’ option for the launcher will not work while the launcher is hidden (A native bug in Unity-2D caused by the ‘use-strut’ gsettings key), you can use “Super” or “Alt+F2” keyboard shortcuts to force the launcher to show.